Why is China Turning Against the United Nations? A new survey finds that support for the UN is highest in the Asia-Pacific. China is a notable exception. A new survey finds that the Chinese public takes an increasingly unfavorable view of the United Nations, in sharp contrast to opinions among its neighbors. Ahead of the UN General Assembly meeting in New York City next week, the Pew Research Global Attitudes Project surveyed people from 39 countries on their views of the UN. Overall, the body iis popular worldwide, with outright majorities in 22 of 39 countries holding a favorable view of it. Still, the UN was not universally loved in the Asia-Pacific. For example, only a slight plurality of 45 percent of Japanese view the international organization in a favorable light, compared to 40 percent who view it negatively. Support for the UN was lowest among Asian countries in Pakistan, where 20 percent have a negative view compared to 18 percent who see it in a positive light. A large majority of 61 percent of Pakistani respondents don’t have an opinion one way or the other. But perhaps the most surprising results came from China where a plurality of 45 percent of respondents expressed an unfavorable opinion of the UN compared to 39 percent of Chinese who had a favorable view. This made China the only permanent member of the UN Security Council where less than a majority of the public had a favorable view of the UN. By way of comparison, 53 percent of Russians, 58 percent of Americans, 63 percent of French, and 64 percent of British respondents have positive feelings about the UN. Further, the Chinese public’s views of the UN have declined sharply in recent years. Specifically, the 39 percent favorability rating was a drop of 16 percent from 2009, when 55 percent of Chinese supported the UN. This is by far the most drastic change of opinion of any public surveyed by Pew. The obvious question is why has China soured on the UN so much in recent years? Unfortunately, the data provide little in the way of an answer, and at least two contrasting narratives seem possible. On the one hand, the Chinese public may increasingly dislike the UN because it is unable to constrain what they perceive as aggressive powers like the U.S. or Japan. For example, the UN did not stop the U.S. and NATO from changing a mandate to protect to a mission to overthrow the Muammar Gaddafi regime in Libya in 2011, nor has it limited the type of sanctions the U.S. and EU imposed on Iran (which affect China as an oil consuming nation). Japan also nationalized the Senkaku/Diaoyu Islands with little regard for the United Nations, and the U.S. has carried out its drone and intelligence war with similar disregard for the body. Another intriguing possibility is that the Chinese public is turning against the UN because it believes the international organization increasingly constrains Beijing’s power. Under this scenario, Chinese citizens would have previously supported the UN as a useful check against “unilateralism” and “hegemonism” in Asia and the world, especially given that Beijing holds a veto on the UN Security Council. As China becomes more powerful, however, it increasingly becomes a nation that may seek to act unilaterally and in hegemonic-like fashion, and thus may be vulnerable to being reeled in by the UN. For instance, as China’s dispute with the Philippines has intensified, Manila has sought to bring China to a UN court to resolve the issue. Beijing has of course resisted this approach, seeing its chances of success much greater when it can leverage its asymmetry of power against the Philippines. Although not the UN, the members of another international organization, the Association of Southeast Asian Nations (ASEAN), are also attempting to use that body to constrain China’s ability to deal with the individual members on a bilateral basis. More broadly, Chinese citizens may see the UN as part of the larger international architecture that was created by other powers when China was still weak. As China becomes more powerful, Chinese citizens as well as their leaders may want to forge a new global order more accommodating to Beijing’s interests, including its prestige. These aren’t the only two possible reasons for the worsening reputation of the UN in China, of course, nor are they even mutually exclusive. Some Chinese may view the UN as a vehicle by which Western powers impose Western values on the rest of the world. Others might fear that by becoming too active in the UN, China could be dragged into messy foreign conflicts like the civil war in Syria. 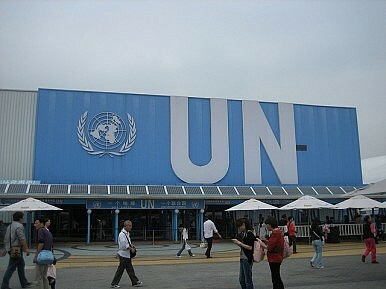 It also may be the case that many people in China simply view the UN as impotent and therefore useless. Whatever the case may be, it’s quite notable that Chinese public opinion on the UN has soured so quickly, and it may give its leaders a freer hand in disregarding the organization when it suits their interests. Then again, there are many compelling reasons why states participate in the UN and accept its legitimacy even if their publics do not.